With Red Nose Day 2017 just around the corner, staff at Russell Finex will once again go head-to-head in the name of charity. 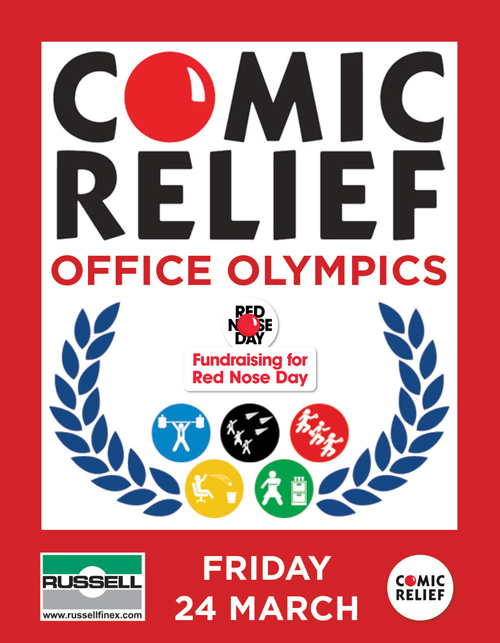 This year, participants will put their teamwork to the test in a series of comical Office Olympics events at the company’s UK headquarters, raising money for Comic Relief. Like 2016’s Sport Relief triathlon, which saw teams rowing, cycling and running to victory, this year’s Comic Relief event will pit Russell Finex staff against each other, providing healthy competition and a team ethic. Each team will be comprised of six members, with a series of fun office-themed challenges to complete within a set time. All participants will be raising funds for Comic Relief in the lead-up to the event. At the end of the competition, scores will be compared and points will be awarded per event, with the winning team being the one that has accumulated the most points across all events. Olympic medals will be awarded to the winning team, as well as the second and third placed teams, and Russell Finex will also match the amount of money raised by the winning team. Comic Relief has been helping disadvantaged people and families in the UK and some of the world's poorest communities since 1985. In the last two years, over 8 million people have benefitted from the money raised by events such as this, and 2016 saw over £72 million raised through Comic Relief and Sport Relief campaigns. Russell Finex has set a healthy target of raising £1500 this year, and welcomes donations of any size. Donations can be made via the Russell Finex Office Olympics Fundraising page. To keep up to date with how the teams are doing and capture some of the action, live streaming of the event will be available from 9am - 1pm on Friday 24th March. Please visit Russell Finex's YouTube page or the News and Events section of the Russell Finex website to access this on the day.